A necessary reminder that the diversity of the people in the USA is one of the things that makes us great. 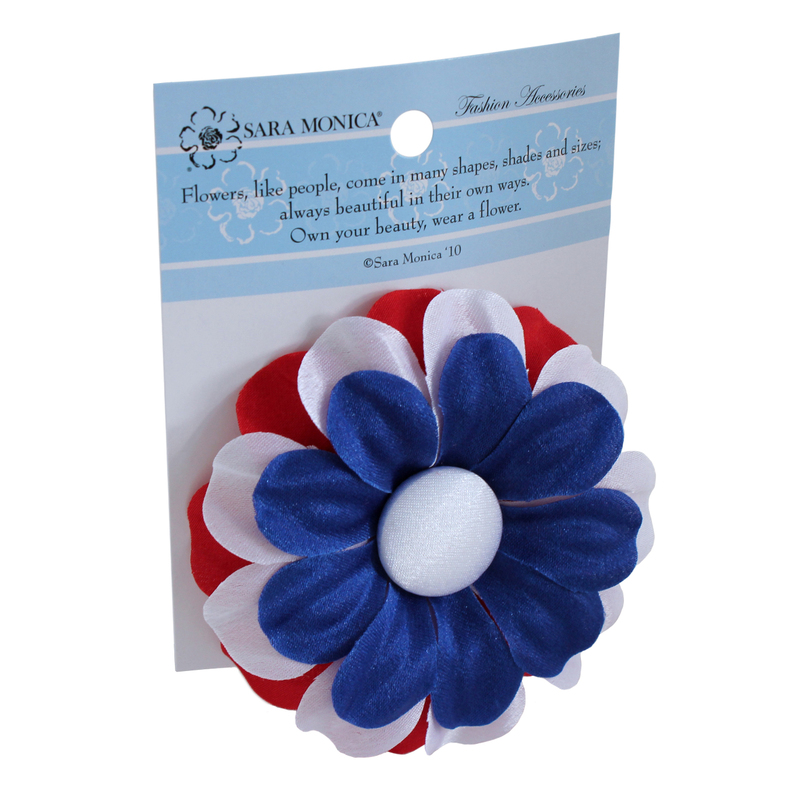 The Patriot Daisy is entirely made in the USA. The fabric was purchased from a small family owned fabric store in NJ. The fabric stiffener used to pre-treat the fabric is made from the ingredients of an American manufacturer. The die to cut the petals was custom made by a die maker in NYC. The vintage bronze mold used to shape the petals was hand designed and hand cast around the late 1800′s or early 1900′s by American flower tool artisans in NYC. The header card was printed in TX. And the final flower was entirely made (fabric washed, stiffened, stacked, die cut, petals pressed, petals assembled) in the Studio of Sara Monica Flower Crafts. Click here to buy them from the Sara Monica Store!! 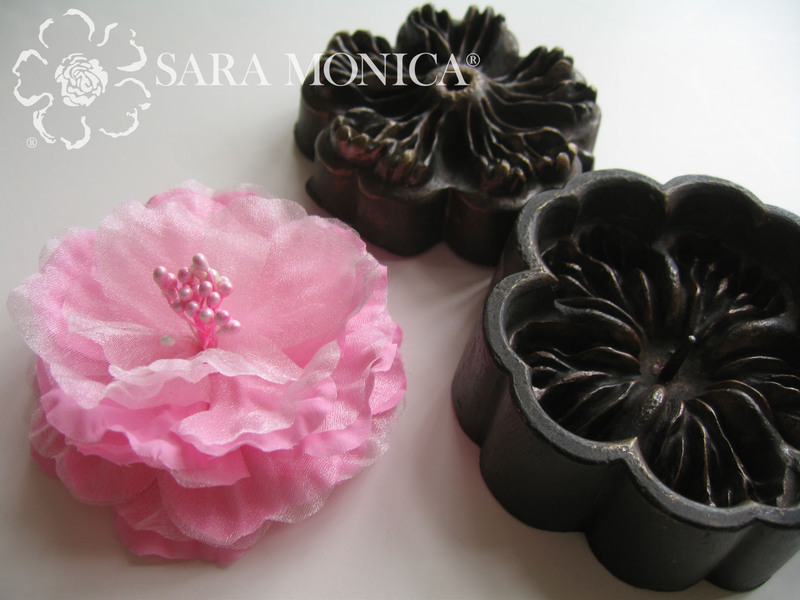 98% of our custom made flowers are made with vintage bronze flower molds (aka: veining tool, flower iron and/or flower die) which were handmade and cast around the late 1800’s early 1900’s by the flower millinery tool manufacturers of New York City. It’s always so much fun to press a petal from a mold for the first time to see the secrets of its beauty that was hidden for 100 years. In the late 1800’s and early 1900’s there were many flower tool manufacturers in New York City’s Fashion District. The mold designs were all handmade, hand carved from plaster and hand cast typically in bronze and/or iron by an artisan specially trained in the trade of flower tools. They were popular in that era because the hat makers, also known as “Milliners”, used them to make flowers to decorate ladies hats. This is why the fabric fashion flower is known as a “Millinery Flower”. In the 20’s and 30’s NYC was heavily factory based. Eventually hats fell out of daily fashion. After WWII, by the mid 50’s to 60’s the flower die factories moved out of NYC to cheaper areas such as Brooklyn and Long Island. And then, in time, closing down as the industry became outsourced to Western Block Countries (including Soviet Occupied Germany) and then to Japan, Korea and China. China is now the largest manufacturer of Millinery Flowers. And in America there are still small studios, such as Sara Monica LLC, that hand make them as well. There is still one last large scale millinery flower manufacturer in NYC who I admire and refer many customers to. Now Millinery flowers are more often worn in hair and clothing rather than hats, since not as many people wear high fashion hats. The difference between a Millinery Flower and a fabric flower that you would find in the home décor section of a craft stores on a plastic stick is that the plastic stick flowers are made specifically for home décor and the Millinery Flower is made to be worn. And the Millinery Flower is typically made out of higher quality dress fabrics. Many Millinery flowers have been designed for home décor as well and many home décor flowers have had their plastic sticks removed by crafters to be worn. The home décor flower’s intention is to imitate nature exactly. But the Millinery Flower’s intentions are not to imitate nature exactly, but to be inspired by nature and interpreted into a creative design, an artistic expression. A Millinery Flower is a genuine handmade work of art.